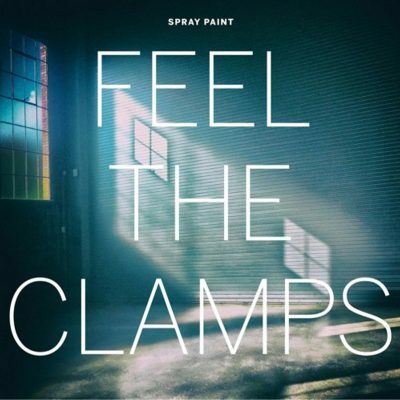 Feel The Clamps is the sixth album recorded by Spray Paint, and it’s a miracle they still get record deals. The overt goal of the band is to be a staple in the anxious, burgeoning post-punk genre in all its weird, wild and edgy glory. The problem is that their idea of weird is to have every lyrical line be completely unrelated to the line before it. All three of them sing at the same time and on the title track, they all moan out, “I feel the clamps / I think they only use salt around here/ It seems like everyone’s getting cancer.” If I had to throw a shot in the dark, I’d say that these guys worked as accountants before reaching a severe mid-life crisis (as accountants are wont to do) when they realized that they’re the most boring people on the planet, and with all the imagination they could muster, they formed a band where their idea of originality in art is equivalent to a ninth grader’s secret poetry collection. When these guys try to act wild, it comes across like a small trickle of angst that they never had the chutzpah to let out, and after all these years, they’re finally free to yell out, “Shut up! I’m drinking over here.” But it’s not only lyrics that fall short of the mark. Their own press release for the album flat out states that the band is “aggressively mediocre” but that aggressively mediocre bands are “really, really prolific and have amazing work ethics.” If I wanted to listen to a band for the sole reason that they have amazing work ethic, I’d listen to The Cure—maybe The Human League—but I don’t. The best part is that they’re trying to be edgy by singing about doing household chores on acid (I have my doubts), mentioning models’ knees like some shy Victorian schoolboy and using the word “cocaine” in a way that almost guarantees that they’ve never even seen it. Musically, their take on putting hard emotion into sound is to rely heavily on dissonant repetition. I’m trying to visualize these guys onstage, and all I can picture is a lot of movement of their heads bobbing around and not a whole lot of movement in their hands. In most of their songs, they’ve managed to put together one measure of material and then they play it over and over again, ad nauseam. Vocally, they repeat themselves all the time, too, but every single time they sing the lyric a second time, they do this weird thing where they switch from a monotone drone to a monotone drone that sort of limps off at the end, which adds to the vibe of social anxiety—something they pull off really well, actually.